The Forza Horizon 4 demo is available now, giving eager road warriors a little bit of driving to do before the full game arrives on October 2. You don't need to sign up or pre-order or do anything special to get in - just read on to find out how you can start racing ASAP and see how it addresses three of the series' biggest issues for yourself. What platforms is the Forza Horizon 4 demo available on? You can download and play the Forza Horizon 4 demo on two platforms: Xbox One and Windows 10 PC. The demo includes special Xbox One X enhancements as well, in case you're rocking Microsoft's latest system. PS4 or Nintendo Switch versions are extremely unlikely because both the franchise and developer are owned by Microsoft. How do I get the Forza Horizon 4 demo? Just load up either the Xbox Store or Microsoft Store (depending on your platform), search for "Forza Horizon 4 Demo" and start the download. You'll need about 28GB of open storage space to complete the download and installation. What's included in the Forza Horizon 4 demo? The big new open-world element for Forza Horizon 4 is shifting seasons, and you'll be able to experience all four of them in the demo. 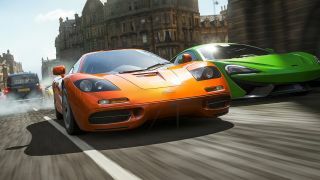 Developer Playground Games also says that you'll be able to try a "heavy-hitting lineup of vehicles" around the recreated roads and trails of Great Britain, but didn't specify how many of the full car list or how much of the map is included. What's the Forza Horizon 4 Demo Sweepstakes? Get even more into gear with our exploration of Forza Horizon 4's invincible sheep.